Abstract - what is GenSession? 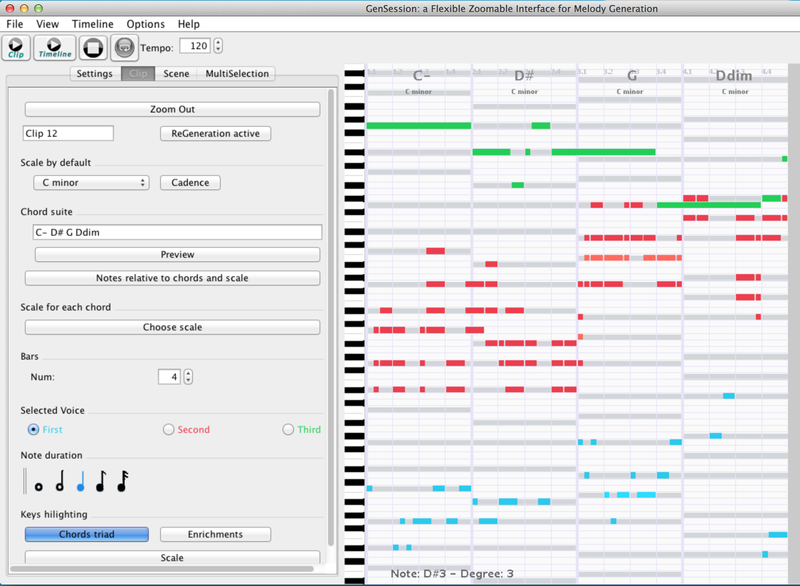 GenSession is a zoomable user interface in which short clips of musical passages can be created and positioned on a 2-dimensional workspace. Clips can be created by hand, or with automatic genera- tion algorithms, and can be subsequently edited or sequenced together. Links between clips visualize the history of how they were created. 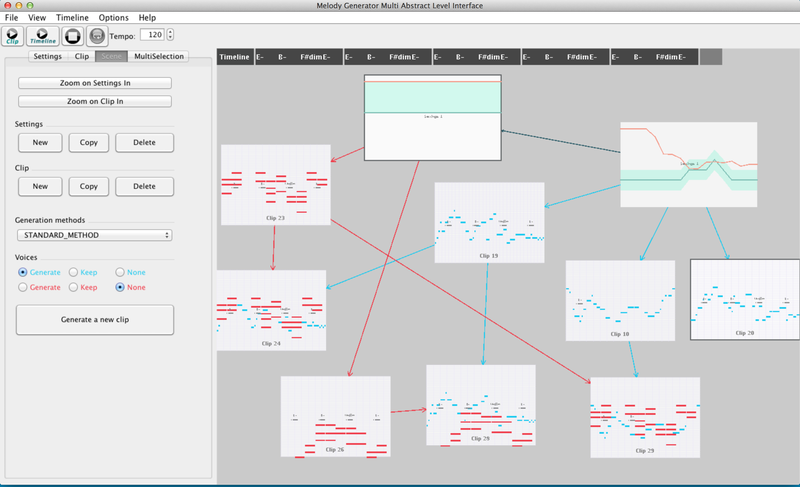 The zoomable user interface is enhanced with an automatic re-framing mode, and the generation algorithms used support dynamic parameters that can be sketched as curves over time. 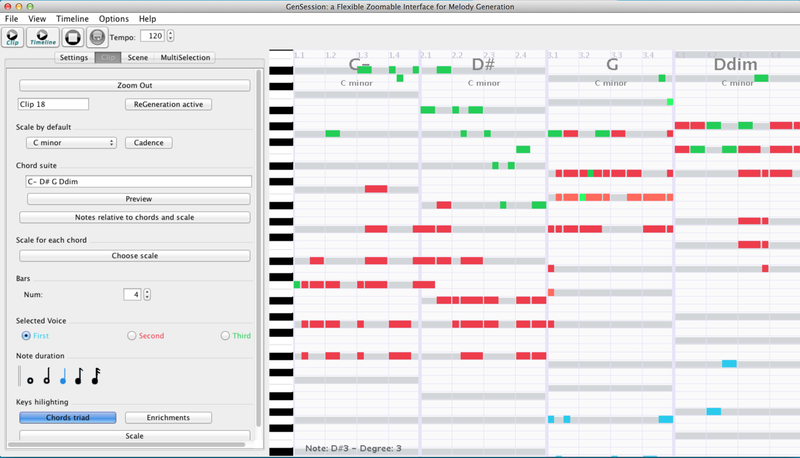 GenSession allows melodies and sequences of chords to be generated quickly without expert knowledge. Initial user feedback is reported. 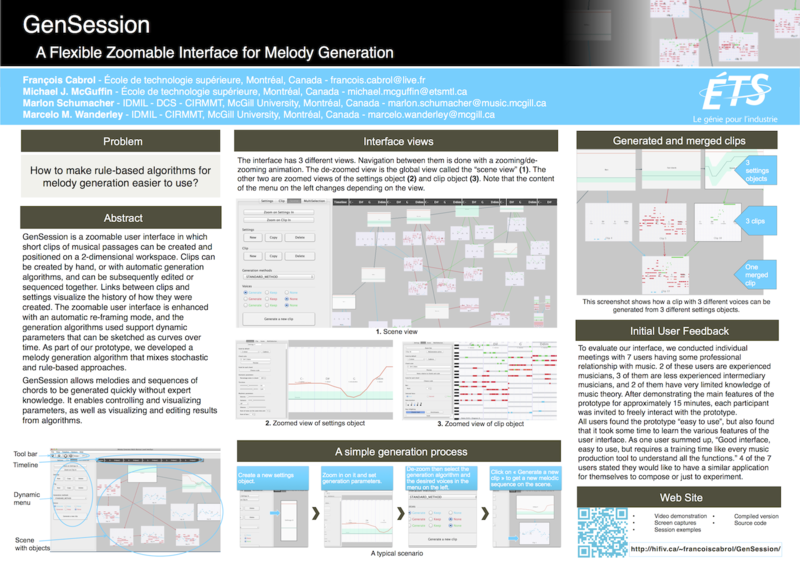 The paper GenSession: A Flexible Zoomable User Interface for Melody Generation" has been accepted at the conference CMMR 2013. CMMR 2013 was the 10th International Symposium on Computer Music Multidisciplinary Research on October 2013. Please see this demonstration video to learn more about the GenSession approach. 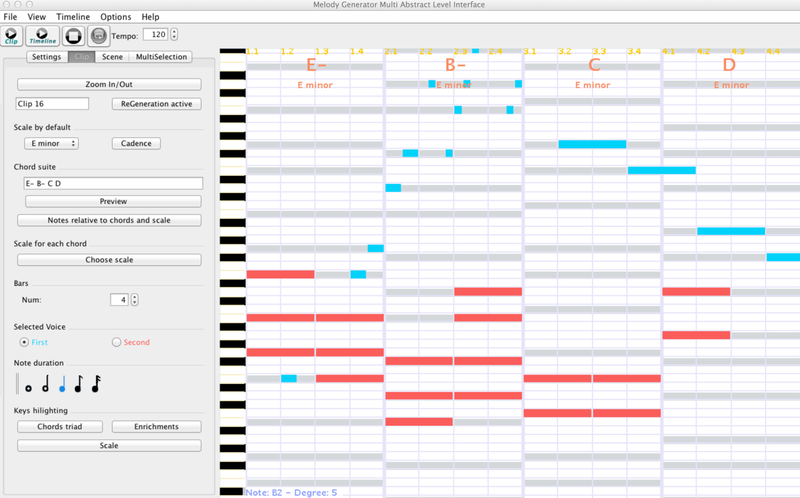 The video show in few minutes how it is possible to create a short midi music sequence. 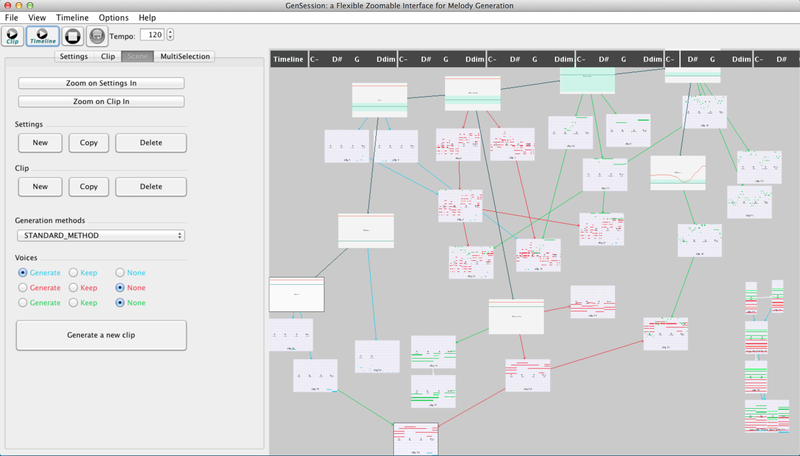 GenSession: a Flexible Zoomable Interface for Melody Generation from François Cabrol on Vimeo. Scene with 3 voices clips. 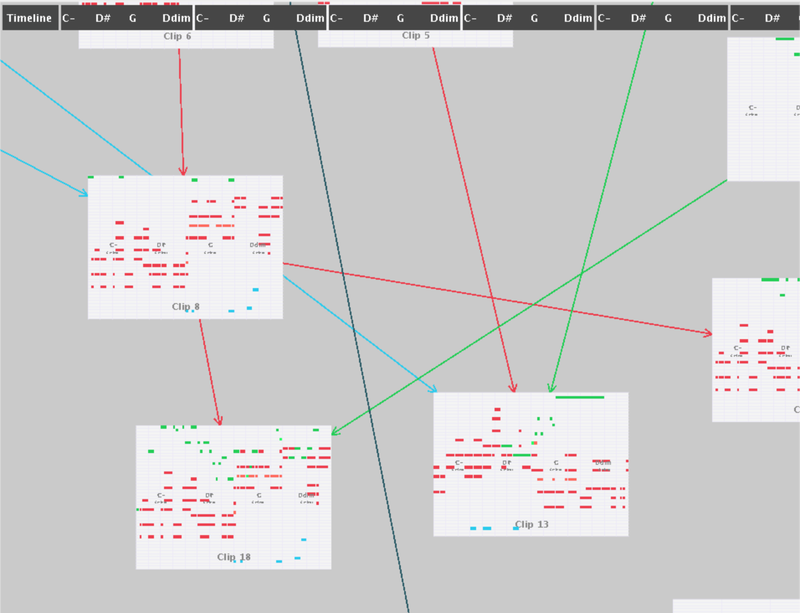 Timeline exported after one three voices session. That you may listen is recorded directly from the sampler software Sampletank (free version) while it was playing the prototype's midi output (the volume is low sorry). Download midi file with 3 voices | Download mp3 file. You cannot get the player, your browser doesn't support HTML5. 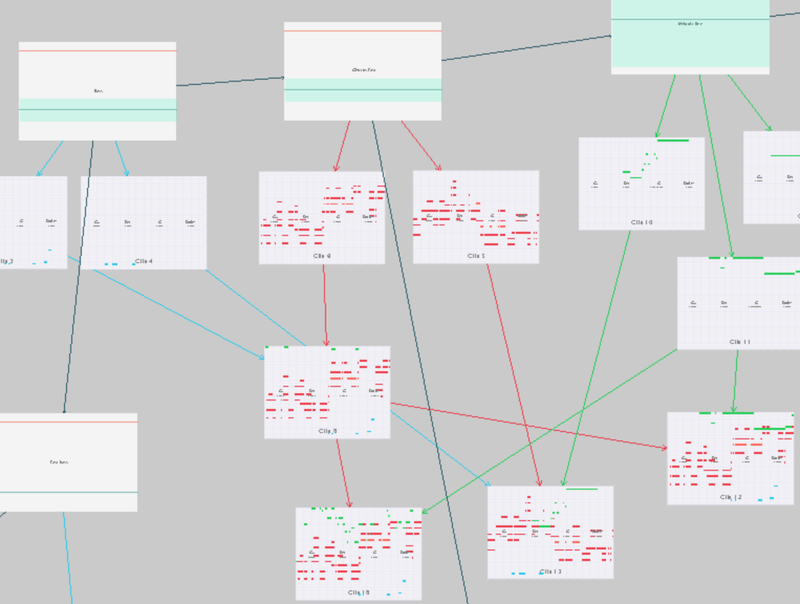 A repetitive music I have done from short musical sequences generated while a little session (around 15min). I've added battery loops, I have done playing the sequences generated by virtual synthesizer and I pre-mixed it in my favourite sequencer. The result is something close to the dubstep style. Download midi file : lead voice and bass voice | Download mp3 file. If you want to try the prototype, please check that you have java installed on your computer, download the compiled version of GenSession, run it and follow the get started instructions. First you have to start by create a new settings object with the left panel. After that you can zoom in with the shortcut "s" (like settings) if the focus is on the scene. If not you can also use the button on the left called "zoom in on settings". When you are in the settings the menu on the left is different. You can play with options. 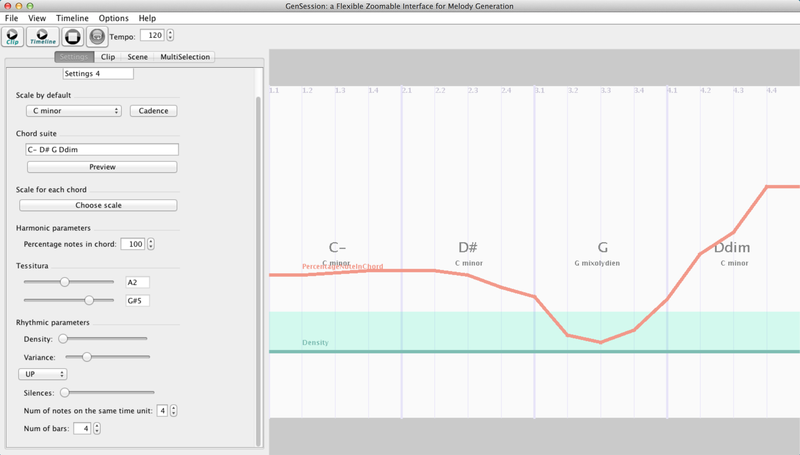 You can write a chords progression directly in the field (as "C D- G7) or generate it from the cadence. You have the last option, it's the num of bars, you can change it to do appear the chords progression on each bar you add. If you want to draw the density as a dynamic parameters, you have to keep press the key "d" and clic on the scene to draw it. If you want to draw the percentage of notes in chords, you have to do the same things with the key "f". After that you can use "BACKSPACE" or "s" or the button on the top left to zoom out and see all the scene. You can generate a new clip by clic on the button "generate a new clip" from the selected settings object. You can zoom on the new clip with "BACKSPACE" or the button on the left. You can play clips when you are zoom out on the scene by double clic on a clip. You can also use the button play clip to play the selected clip or add clips on the timeline and play it. You can do a multiple selection by keeping SHIFT pressed and clic on object. If you select two clips, you can merge two different voices in one new clip. 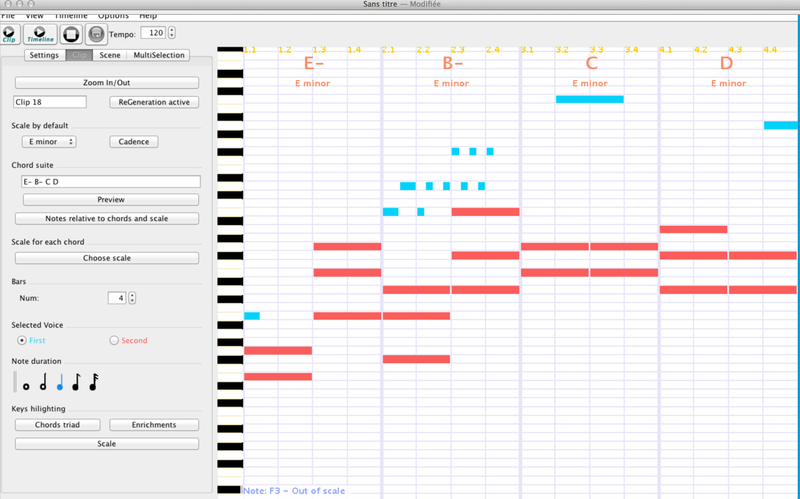 You can use the option menu on the top to open an option panel to set the midi port that you want to send midi message. A poster has been also showed at the conference CMMR 2013. Project managed by the doctor Michael McGuffin, Ecole de Technologie Supérieure de Montréal. More information about the lab at http://hifiv.ca/. The researchers, from CIRMMT, Marlon Schumacher and Marcelo M. Wanderley helped us to write a paper submitted to the conference CMMR 2013. GenSession was my master's thesis project. I did a master's degree Maîtrise en génie des Technologies de l'Information at the engineering school ETS (Ecole de Technologie Supérieure de Montréal). 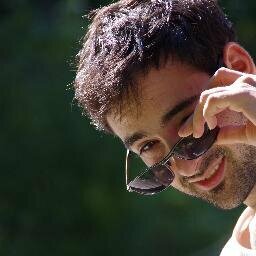 If you have more questions, don't hesitate to send me an e-mail at francois.cabrol@live.fr.